Use our roll storage units to help organize your packing areas. 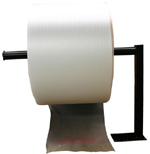 Our wall mounted dispensing roll racks are idea for areas with limited floor space. The floor model roll storage units come in two models, with or without a hold down bar. All the roll storage stands can be made mobile with optional casters. Riverside Paper can custom make a roll storage unit to fit your specific needs, call today.